Student was homeschooled according to state law. • Need the diploma in a hurry? Click RUSH PRINTING tab above. above; please review your student's information before submitting. NOTE: No refunds are given for Wallet Diplomas. 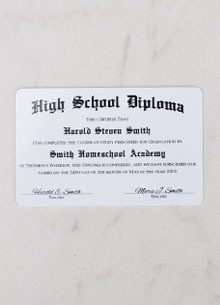 We guarantee that each Wallet Diploma will be produced according to the information provided to us on the order form. If we have made an error, we will gladly reissue your order as soon as possible. However, we are not responsible for errors caused by incorrect information on the order form and will not provide a refund in such cases. If you place your order before 11:00 a.m. ET on any business day, you may make changes to your order up until 11:00 a.m. ET that business day. If you place your order after 11:00 a.m. ET on any business day, you may make changes to your order up until 11:00 a.m. of the next business day. From Paula Blackwelder of Haines City, Florida on 3/11/2019 . From Christine of Adrian, Michigan on 6/23/2018 . From Joseph Day of Nashua, New Hampshire on 6/10/2018 . From Cleveland Rhodes of Clarksville, Tennessee on 5/31/2018 . From Mary Ellen Hunt of Walker, West Virginia on 5/27/2018 . From Christine Fronce of Adrian, Michigan on 5/25/2018 . From Anonymous of Fargo, North Dakota on 5/8/2018 . Personalized items can take up to an additional three business days to process. 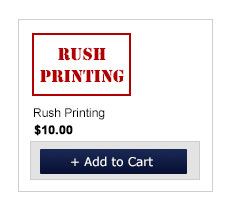 If you need your personalized item right away, we recommend you select the "Rush Printing" option for your order. This ensures that your personalized item will go out the next business day.